The RT-AC5300 runs ASUSWRT OS and includes the Game Boost section that includes the new WTFast feature. I covered this in the RT-AC88U review, so won't repeat myself. Since this is basically an RT-AC88U with a second 5 GHz radio, the wireless professional settings are also the same. So I again refer you to the AC88U's review for the details. One thing the AC5300 has that the AC88U doesn't is SmartConnect. So here's what the default settings look like in the Network Tools > Smart Connect Rule screen. The Smart Connect rules have evolved from those in the 3.0.0.4.378_4129 RT-AC3200 firmware version I reviewed. If you look closely, you can see changes in the RSSI levels, PHY Rate and Target Band settings. The latest SmartConnect firmware also adds a VHT selector to the Interface Select and Qualify Procedures section. SmartConnect remains a neat idea that may or may not work for you. If it doesn't work, it's not all SmartConnect's fault; some devices just don't like being told which band to connect to and resist efforts to steer them. Another thing the AC5300 doesn't have is support for wireless bridging. If you want a 4x4 ASUS router on the other end of a wireless bridge with the AC5300, you'll need to use an RT-AC3100 or RT-AC88U. Like the AC88U, the AC5300 supports link aggregation on LAN ports 1 and 2. The Router Charts graphs below show the top end of the storage benchmark write and read charts using our standard procedure with USB 3.0 connections and NTFS drive format. I disabled the Reducing USB 3.0 interference setting in the 2.4 GHz Wireless Professional settings tab and also disabled iTunes, DLNA and FTP servers before running the tests. There is obviously something wrong with the RT-AC5300's USB 3.0 connection, given it yielded only 31 MB/s write and 34 MB/s read. But I got the same result on multiple attempts, so there is likely something at the driver level that needs tweaking. If you check the other benchmarks, you'll see similar throughput. Routing throughput was measured using our standard router test process with the router loaded with 3.0.0.4.380_838 firmware. Table 2 summarizes the results and includes the NETGEAR R8500 and RT-AC88U for comparison. All three routers have similar performance as you would expect from such similar hardware platforms. For the unidirectional tests, the IxChariot chart below is typical of what we see with other current-generation routers. Uplink throughput is slightly higher than downlink. The start of the simultaneous bidirectional test shows the usual IxChariot quirk. The drop in WAN > LAN throughput within the one minute test period for both the AC5300 and AC88U is certainly interesting. Note LAN > WAN (uplink) is unaffected in both cases. The ASUS RT-AC88U was tested using our Version 8 Wireless test process with 3.0.0.4.380_838 firmware loaded. Our standard practice centers the router's antennas on the turntable, both front-to-back and side-to-side in the chamber. This method is intended to keep maximum distance between the router under test and chamber antennas as the router rotates during test. All eight antennas were pointed straight up for testing. I filtered the charts to show 2.4 and 5 GHz down and uplink profile benchmarks for all 4x4 router classes, i.e. AC2350, AC2600, AC3100 and AC5300. The plots show total average throughput for all measurements. Keep in mind these results are with AC1900 class (3x3) client with 20 MHz bandwidth mode used in 2.4 GHz. Note that higher router class doesn't necessarily mean higher performance, even with our 3x3 test client. For a more detailed look at wireless performance using throughput vs. attenuation plots, let's compare the AC5300 with the only other Broadcom-based 4x4 product tested so far, NETGEAR's R8500. I also included the ASUS RT-AC88U since it has basically the same radios, but only one 5 GHz. For 2.4 GHz downlink, the NETGEAR starts out with the highest throughput, but moves below the two ASUSes from 36 dB attenuation onward. 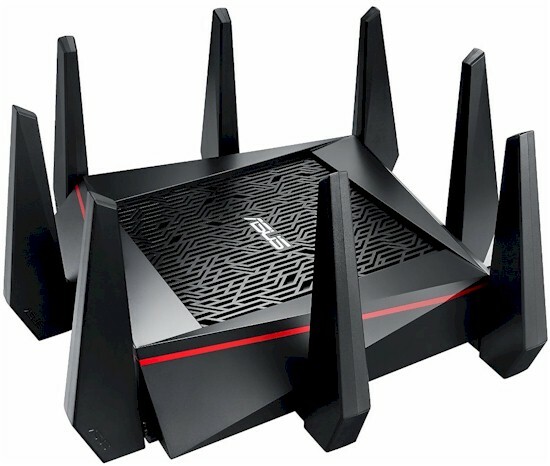 The two ASUS routers track pretty closely. For 2.4 GHz Uplink, the AC88U and R8500 both start out significantly above the AC5300. But from the mid 20's onward, the three track pretty closely. 5 GHz downlink has the AC88U tracking below the AC5300 and R8500, which track pretty closely. For 5 GHz uplink, the AC5300 finally wins one! Aside from strong signal 2.4 GHz, these three routers seem to have very similar performance.